With the recent releases of screen caps previewing the upcoming Windows 8 operating system, we were excited to hear Microsoft has also had a new release of VS in the works as well. 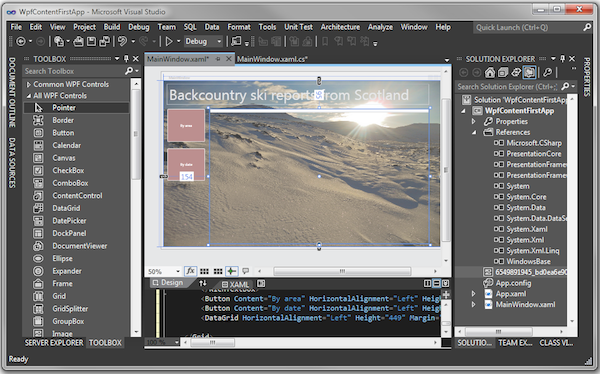 Monty Hammontree, the Director of User Experience in the Microsoft Developer Tools Division posted on his blog the outline and direction they are taking with VS11. As a developer tool set is concerned, the main objective is to keep the developer (us) working on new code and spending as minimal time orienting themselves to the project and tools they are working with. His post states that in the current environment some programmers are spending (in some cases) only 15% of their total time in VS actually writing new code. Their new approach to the interface is to ultimately lessen the clutter and lower the amount of wasted space with unused toolbar options all while updating the theme to the new monochrome style which is becoming more apparent in other software suites as Adobe CS5.5. Coping with tool overload. 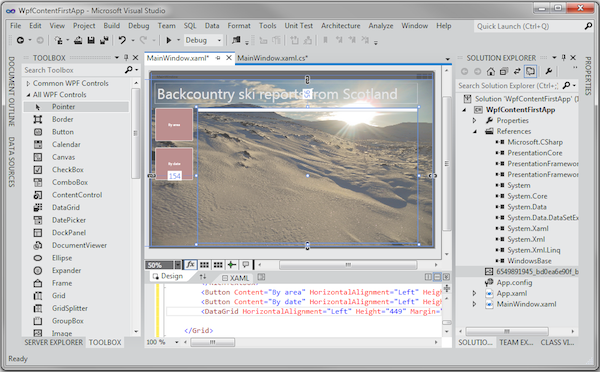 Visual Studio provides a large amount of information and capabilities that relate to your code. The sheer breadth and depth of capabilities that Visual Studio provides, at times, makes it challenging to find and make effective use of desired commands, options, or pieces of information. Comprehending and navigating complex codebases and related artifacts (bugs, work items, tests etc.). Most code has a large number of dependencies and relationships with other code and content such as bugs, specs, etc. Chaining these dependencies together to make sense of code is more difficult and time-consuming than it needs to be due to the need to establish and re-establish the same context across multiple tools or tool windows. The first problem mentioned, being the tool overload, is getting addressed in the four main UI areas. They are- in the command placements, colorized chrome, line work and iconography. The command placement is addressed by Microsoft reducing the toolbar command placements throughout the entire program by 35 percent. Objects such as the copy, cut and paste buttons are being removed as it has shown that most developers rely on the keyboard shortcuts to complete these tasks. As well, Microsoft is now providing a customizable interface which allows users to change the overall theme from the original light grey environment, to a more defined dark UI that has a coding sheet similar to a command prompt window. As you can see, Microsoft has been very busy redesigning their entire look and feel of upcoming products. From the revolutionary design they first implemented on their phones, which is now getting migrated into their new operating system, to an entire overhaul to the look and feel of their Visual Studio application. We at Amortech are excited to see this new generation of Microsoft products, and look forward to testing out and developing in their new environment soon. We are sure their improvements will directly correlate to the productivity of our work force, and our products will show this. Come back soon as we will have a more in depth look at this piece of software once its finally released and we can get some experience working with it.